I made these works during my residency at Fremantle Art Centre in October 2018. 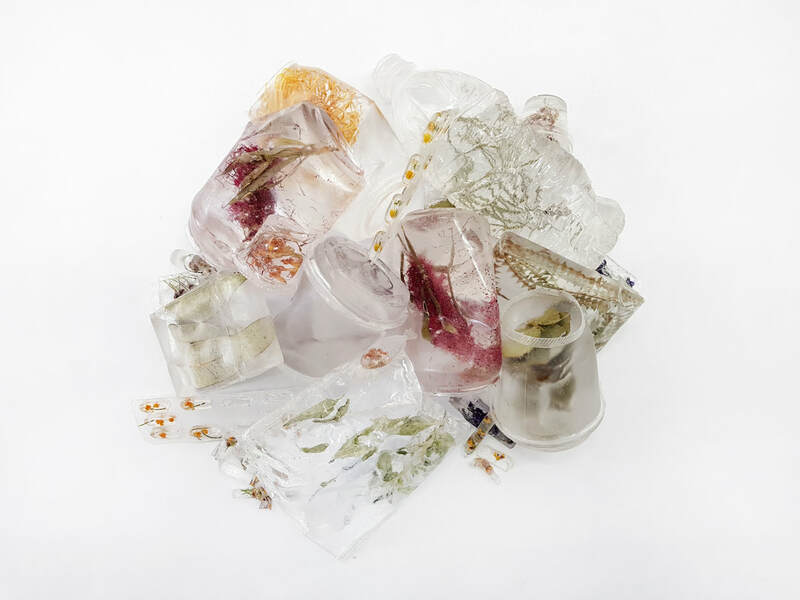 The cast forms are taken from single use trash I found on my walks and contained within the resin are flora endemic to WA. You can read more about it here in an interview I had with FAC. This interactive installation intertwines the significance of water in Australia and the layers of forced environmental change since colonisation that led to mass decline in biodiversity. It overlays time and place to express the need for human accountability and the painful complexity of animal and environmental ethics. I use my ongoing practice to reciprocally investigate and challenge my own perceptions within a culture of incompatible truths. I’ve formed a specific sculptural language that gives communicable presence to the moment my conflicting perceptions and their accompanying sensations clash: The push and pull of empathy and disengagement that results in perceptual dissonance. ‘Cow in the wattle’ is the latest installation in this continuing exploration. In Australia we have an interesting relationship with cows. They are a docile species that we can empathise with and romanticise in scenic landscapes. They were brought over with the First Fleet to create industry around their meat and milk, but as an introduced species that didn’t evolve with the land they have become another layer of forced environmental change that has had enduring consequences. Despite the mass destruction of complex ecosystems from the introduction of numerous livestock, crops, and farming methods onto a well-managed continent, the husbandry of animals such as the cow has become part of our national identity. A notion of taming a wild landscape that has endured. Today there are around 28,000,000 cows at a time in Australia living as an indentured species. 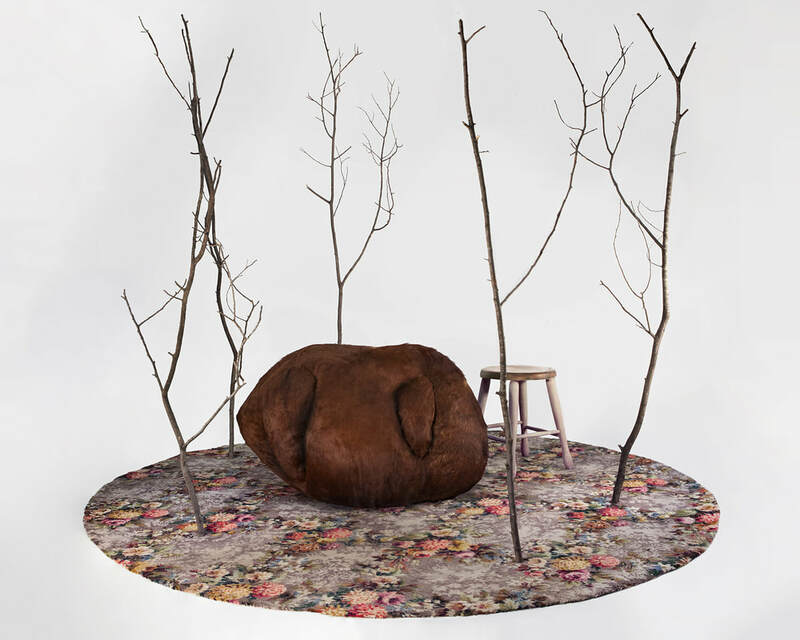 I invite viewers to enter the installation space and sit with the warm, breathing cow form amongst the dead wattles. 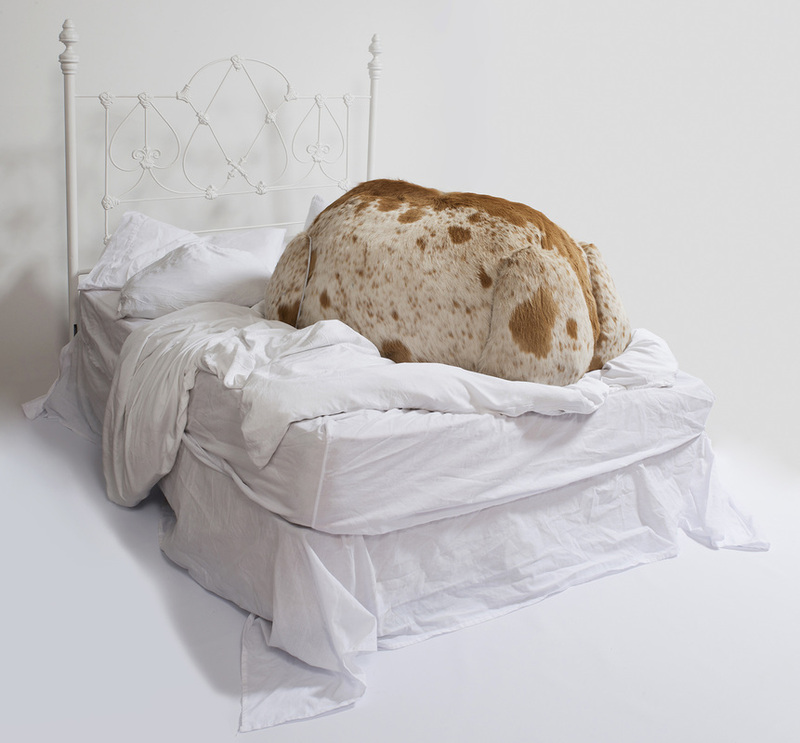 The found skin holds the ongoing agency of the cow beyond death and speaks of its placement on a hierarchy as a commercial object. ‘Cow in the wattle’ overlays time and place to express the need for human accountability and the painful complexity of animal and environmental ethics. Since I was a small child, I’ve been entranced by the inconsistent relationships humans have with other animals. I use my ongoing practice to reciprocally investigate and challenge my own perceptions within this culture of conflicting truths as we teeter between empathy, disconnection and malice. Rabbits, as pest, product and friend, have manifold meaning to us in Australia. Originally introduced during colonisation to make settlers feel more at home, they are another layer of forced environmental change that has had enduring and destructive consequences. By 1910 rabbits had reached a natural limit of about 1500m above sea level, but in recent years they have been rising higher into the Snowy Mountains having evolved to survive on the toxic leaves of eucalyptus saplings. 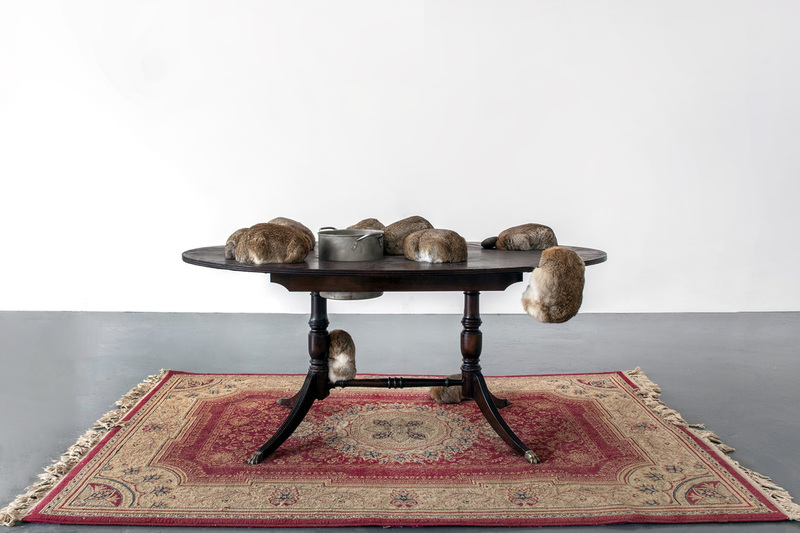 This living work overlays time and place to express the complexity of animal and environmental ethics, a need for human accountability and the continued resilience of both the invasive species and the misinterpreted environment they were introduced into. 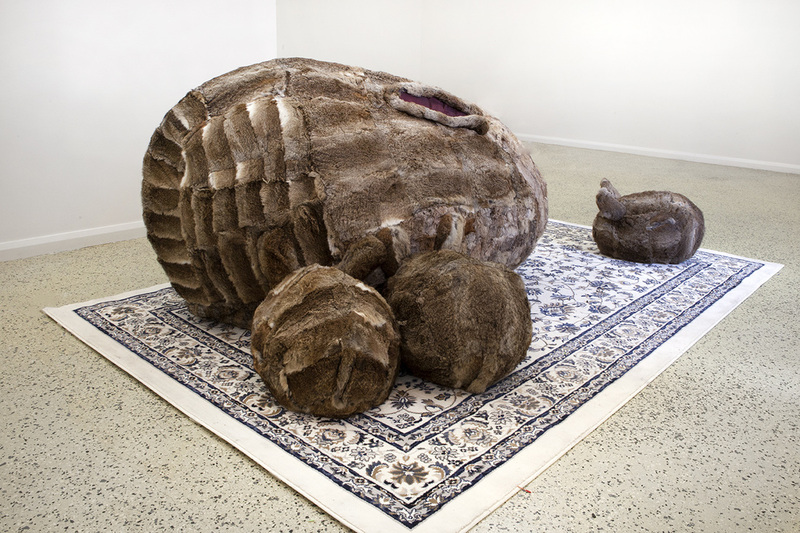 This work was commissioned by the Museum of Australian Democracy at Old Parliament for display in their children's exhibition, PlayUP. 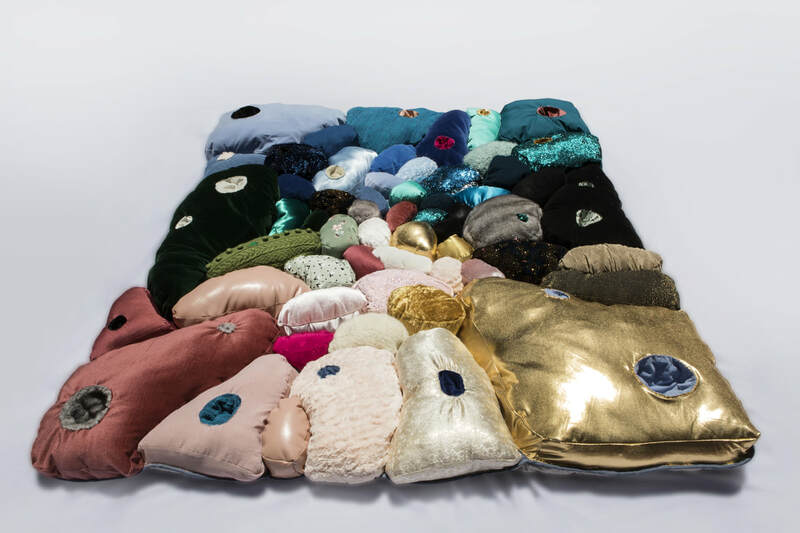 It's a soft sculpture sensory quilt made especially for children 0-2 years old and for kids with special sensory needs. 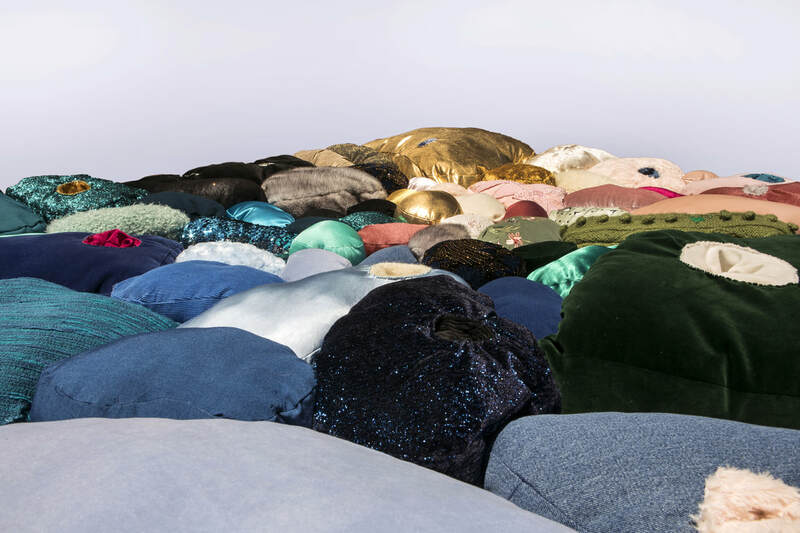 Largely hand-sewn and made from pre-loved clothes and fabrics, it allows for concentrated exploration of colour, texture, pattern, dimension and density. I was inspired by living patterns and forms ranging from cellular to mammalian. I wanted to create something for kids that would be exciting, stimulating and different, while still being comforting and safe. At a stage where the majority of their learning comes through physical exploration of their immediate environment, it was important to me that the quilt can provide kids with a really special experience. It measures 2.1m x 2.1m and weighs 6.7kg. Second hand clothes and fabrics, soft fill, thread. 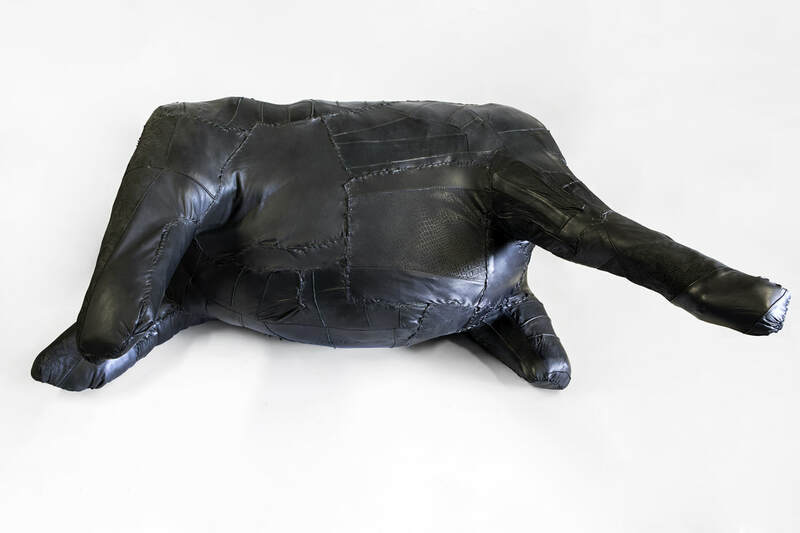 The Musical Miscellaneous Animal series was created while on a residency to Fremantle Arts Centre and is made from various used commercial skins. The forms are meant to be held close while you wind their music boxes inside. In the video below, I used stop motion as a secondary means of reanimation. 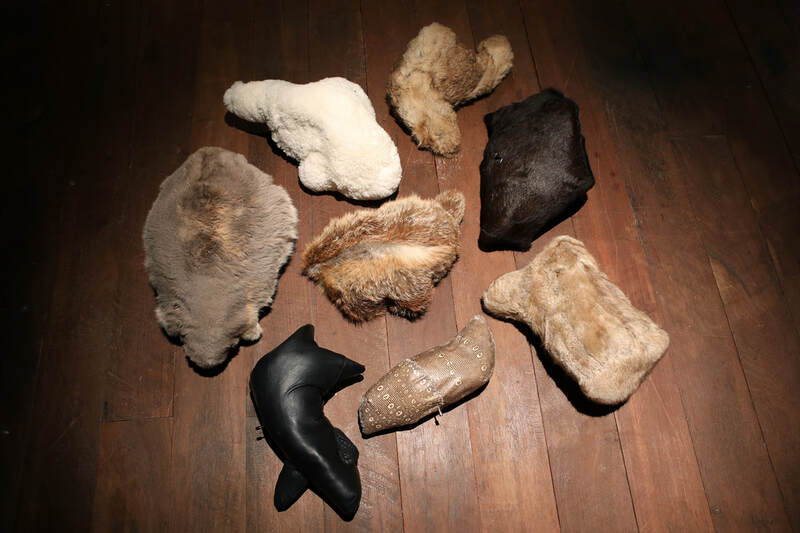 Used items of commercial origin (rabbit skin coat, sheepskin pram liner, cow hide rug, kangaroo pelt, fox fur coat, reptile skin bag, mink coat, pig and lamb skin skirt) music box, wire, synthetic stuffing, polyester thread, found fabrics, wood, zinc weight. My practice is the traversing of hypocrisies through action, a kind of masochistic movement through difficult materials. 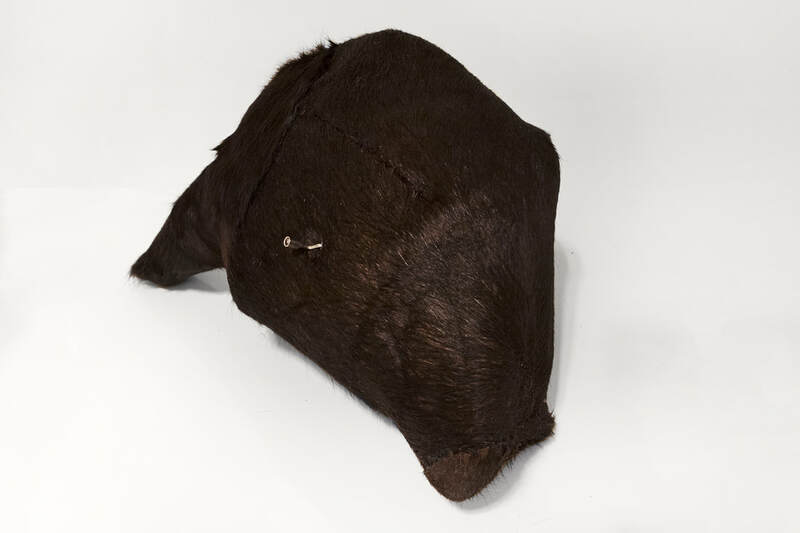 The skin of this tactile, breathing form is made from my old leather clothes and it traces together a history of the original animals and their second lives as an extension of the human body. Through this partial self-portrait, I question the ubiquitous use of leather in our society and our disconnection from its origins. It is at once human and non-human, animal and object, powerful and futile. It pulls us into an uncomfortable space between empathy and disconnection. 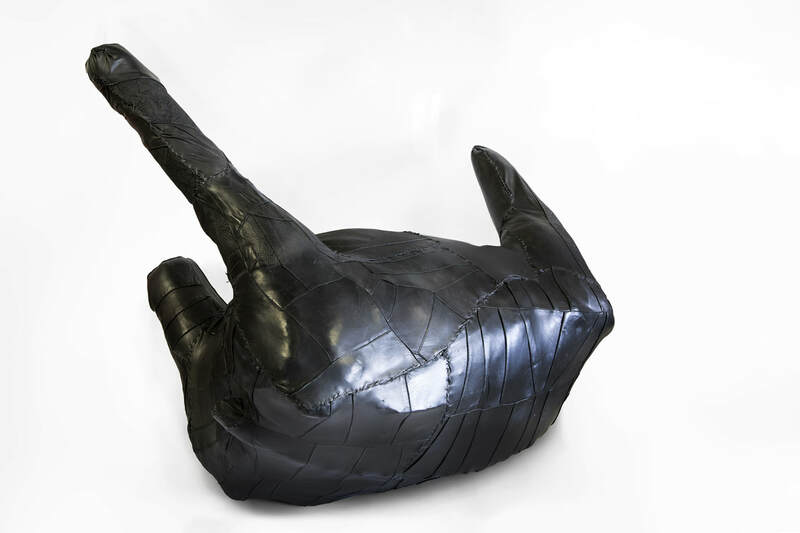 Artist's used leather garments, used hosiery, steel, planetary motor, electrics, plaster, used synthetic stuffing, polyester thread. Since I was a small child, I’ve been entranced by the inconsistent relationships humans have with other animals. We can easily empathise with them on the one hand, but disengage on the other: denying them agency and treating them as objects. Representations of non-human animals find their way into our perceptions, but rather than forming a smooth whole they exist in separate parts of our mind ready for appropriate contextual usage. I use my ongoing practice to reciprocally investigate and challenge my own perceptions within a culture of conflicting truths. I have formed a specific sculptural language that gives communicable presence to the moment my conflicting perceptions and their accompanying sensations clash: The push and pull of empathy and disengagement that results in perceptual dissonance. Rabbits, in particular, have manifold meaning to us. 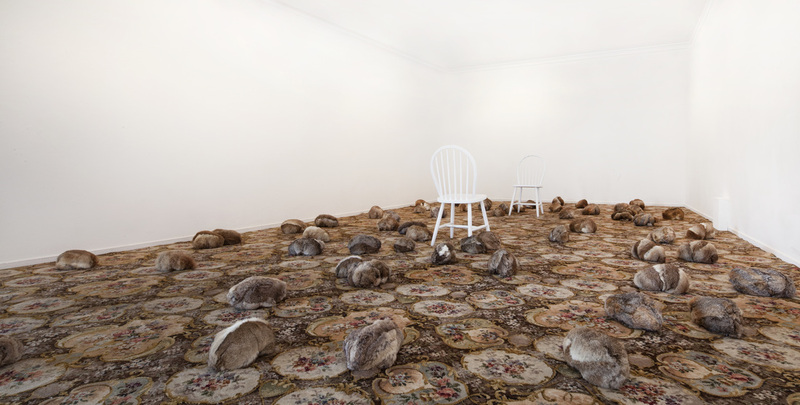 In ‘Lapin Plague’, I have blurred the contextual boundaries between pest, product and friend in a bodily experience, creating a strangely nostalgic space evocative of Australia’s European ties. I invite viewers to enter the constructed space and interact with the forms. 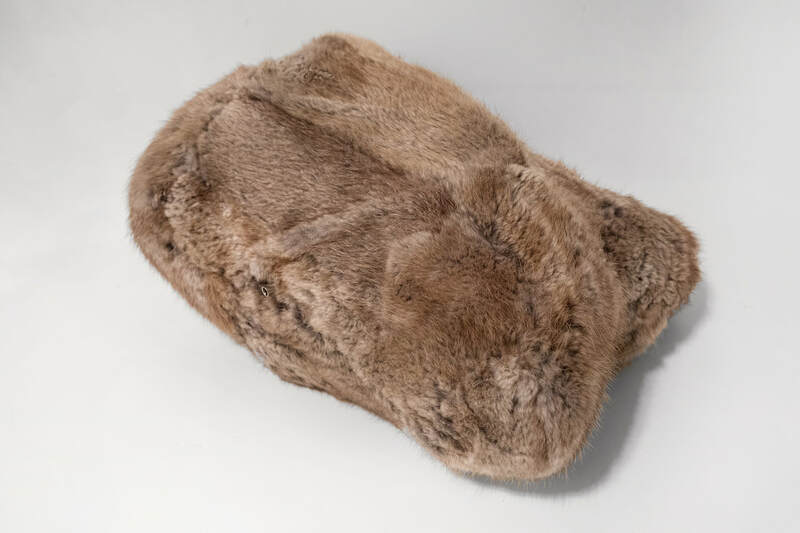 They are soft and inexplicably warm, made from found rabbit fur coats over padded and wired skeletal steel armatures. 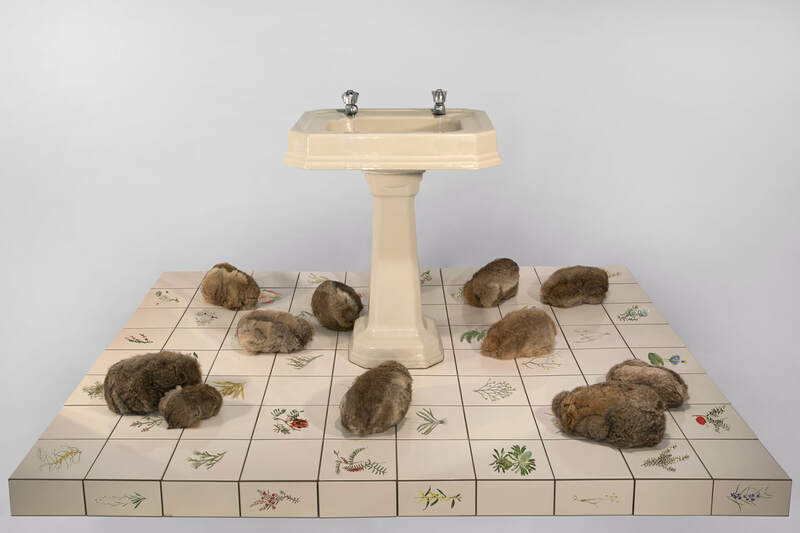 These skins hold the ongoing agency of the rabbits beyond death and speak of a placement on a hierarchy as commercial objects. 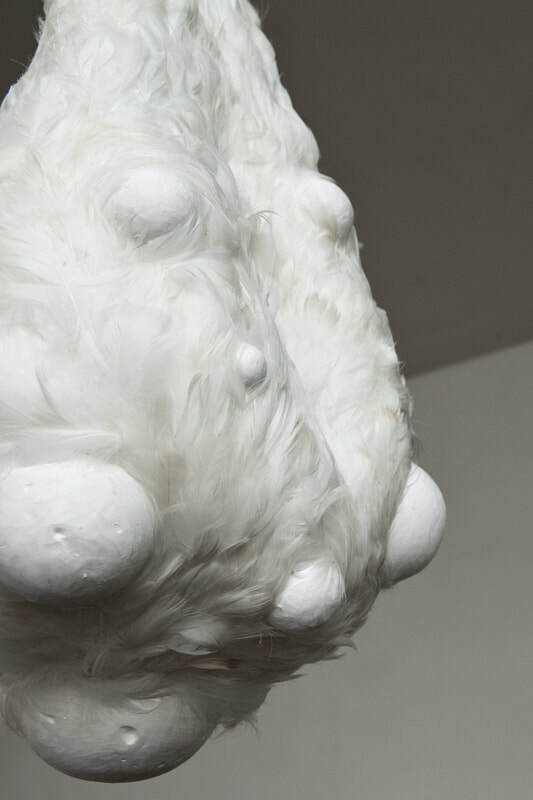 In their reappropriation through sculptural form, they are able to communicate a powerful presence to conflicting perceptions of non-human animals. In plague like numbers they are still and vulnerable, returned a limited semblance of life through warmth and basic form, but lack communicatory organs and substance. 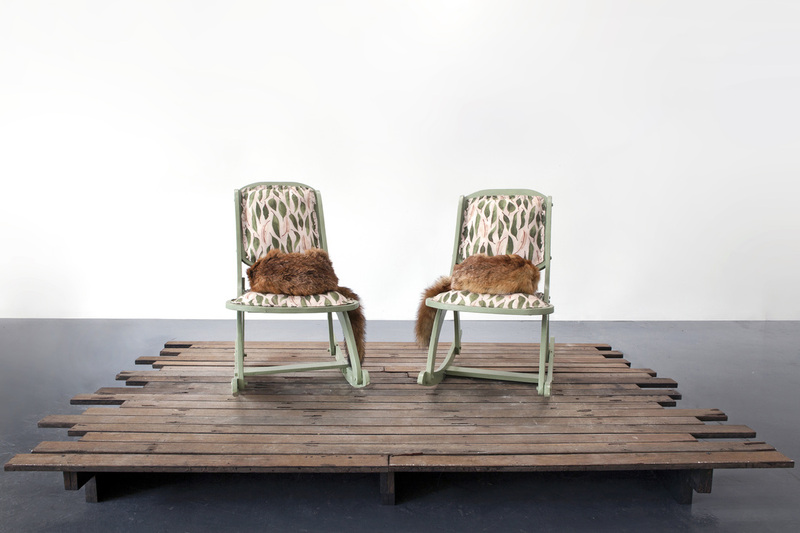 They gravitate towards the central chairs, imprints of the human body and symbolic of how our communication constructs the physical and representational world around us. The forms in this piece are warm to the touch. The forms in this piece are warm to the touch and simulate slow breath. The push and pull of empathy and disengagement that results in perceptual dissonance. 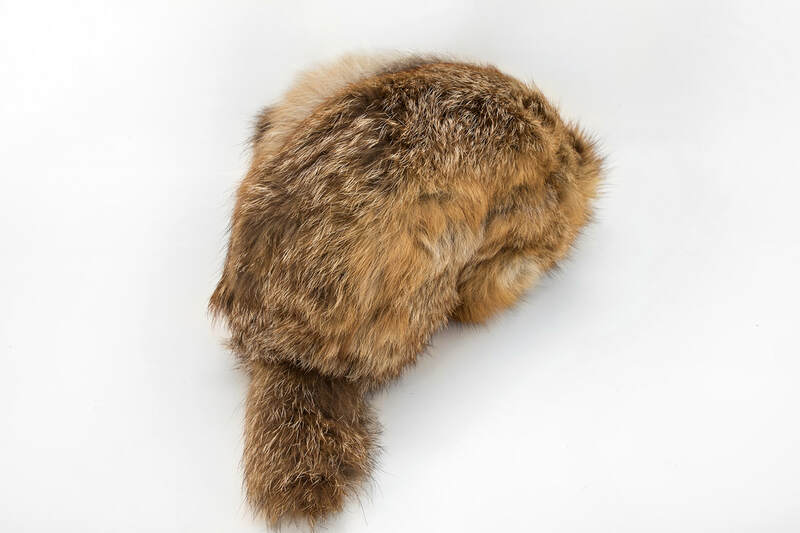 I have explored this through the use of three primary devices: the skins of each animal returned basic form, domestic objects that create a psychological and bodily connection with the viewer, and finally through the use of basic electronics that create a semblance of life. 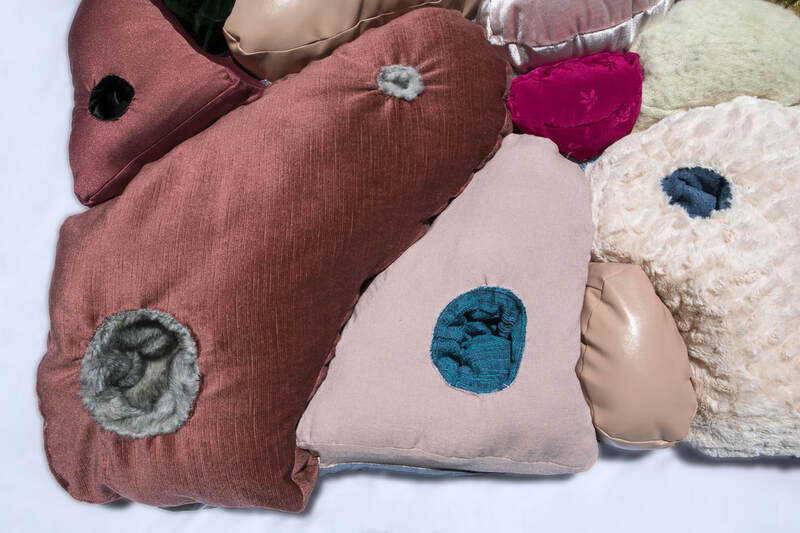 These simulate breath, offer warmth, or create disembodied movement. From its beginnings, the diversification of life has offered numerous sensory means through which organisms can communicate with their kin, such as movement, sound, markings, bio-luminescence, scale or form. As social creatures, our intelligence has allowed us to process a widened range of information and extrapolate data from external events, creating complex communications and realities that can leap into the imaginary. We can extend our identification with those in our own social groupings to other species, and even across other life forms themselves to the inanimate. My works are an exploration of how humans interpret and feel information. I want the viewer to engage emphatically with my works. It is this connection with the inanimate that is of ultimate fascination to me. Duck feathers from pillows, cast and carved porcelain, silicone, solar panels, LED lighting, stainless steel cable, wire. 800cm x 90cm at largest points. Install shots at Jindabyne (Lakelight Sculpture) and Berrmagui (Sculpture on the Edge) March and April 2015. Night photography by Chris Polglase.